Even though winter hasn’t officially arrived Mother Nature has doused us with our first big snowstorm of winter in the Midwest and I’m sure it’s just a taste of what is to follow! With this in mind I’ve been diligently perusing through reviews and reading lists to come up with some new reading material just for you for the impending winter months. The titles range from adult books all the way down to children’s books. Get a head start on Old Man Winter and have these titles ready as the snow begins to fall! Based on the success of our middle school Kindle program (each of our 8th grade students now have their own Kindle to use for their Literature class plus our 7th graders are using Kindles in their Literature class as well) I had wanted to see how we could use the Kindles in the lower grades. I recently read in, The Reading Teacher Magazine, an article written by Lotta C. Larson, “Digital Readers: The Next Chapter in E-Book Reading and Response.” I did a bit of searching to see what else she had written and found at ReadWriteThink an excellent lesson plan she had written! The lesson plan was for grades 2-4. The name of the lesson was: “Going Digital: Using e-Book Readers to Enhance the Reading Experience.” It was like I had discovered GOLD!! Following the proper channels, it was decided we would pilot this program in the K-4 building using this lesson plan with a group of 5 second grade students. 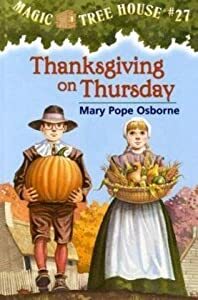 After a few meetings with the second grade teacher, she recommended using the ebook, Thanksgiving on Thursday, part of the Magic Tree House Series, by Mary Pope Osborne. It was a very exciting day when we introduced the Kindle pilot program with these 5 students! Prior to my teaching lesson with the students, their teacher gave them a brief orientation over the past three days. You should have seen their bright eager faces! 1. Turning on the device. 2. Familiarizing the students with the Home Screen. 3. How to access the book from the Home Screen. 5. How to use the Font Size Feature. 6. How to use the Dictionary Feature. 7. How to use the Highlighting Feature. Once all of this orientation was done the 5 students read teh first page to themselves. After they were done reading I asked each of them what they thought which sentences sentences wer were going to highlight and why. After the highlighting was completed, I had them go back to the Home Screen. At the Home Screen I pointed out the “My Clippings” which was now added. I asked them to use the five way cursor to open up “My Clippings.” I had them read what was mentioned. They noticed the title of the book, the sentences they had highlighted, the day and time they had been highlighted, and the location of the highlighted sentences. The lesson took us approximately 35 minutes to complete. The December issue of School Library Journal featured our 2nd Grade Pilot Kindle Program in this article by Lauren Barack, A Kindle Program of Their Own: Second graders try out ereaders, courtesy of librarian Kathy Parker. 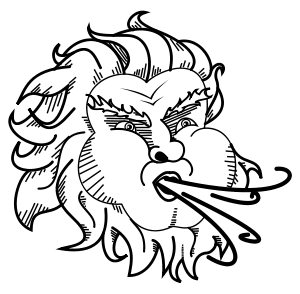 December Read-Alouds: Ho! Ho! Ho! This pictures says it all! The anxious anticipation by an eager young child on Christmas Eve! The timeless mystery surrounding Santa Claus by children all over the world. There are so many stories of Santa Claus and of Christmas itself. Every year at Christmas time, especially on Christmas Eve, I like to share the story with my children, whom are now all adults, the story, Yes, Virginia, There is a Santa Claus. My husband sets the stage and the girls anticipate the tears from me as I read. Their husbands now partake in our family tradition – they are really great sports! These are my Christmas books of choice to read aloud to the students in the Library during Story Time. Many of them are classics for me but I fell in love with the newest addition to my list, The Gingerbread Pirates by Kristin Kladstrup last year! I would really enjoy hearing from you if any of these Christmas stories are books you read or have read to your own children, grandchildren, or students. With this storybook you get two stories in one! Throughout the book on one page you’ll read Clement C. Moore’s Christmas classic, The Night Before Christmas, and on the opposite page a young boy interjects his thoughts about being awake on Christmas Eve. The little boy can’t get to sleep and he knows that’s a no-no in Santa’s book! You’ll enjoy predicting the outcome with your own child. Always a fun Christmas book to read! Gorgeous illustrations compliment the story. It’s Christmas Eve. Jim and his mother have put the finishing touches on the pirate gingerbread men cookies for Santa Claus. Jim’s favorite one they created is “Captain Cookie.” He takes him up to bed with him but “Captain Cookie” is quite curious as to the goings on for Christmas and Santa Claus. Off he wanders downstairs to be confronted by a mouse, other cookie pirates, and Santa Claus! Captain Cookie is on a mission to rescue his crew from a notorious cookie eating Santa Clause. When pirates are involved plus Santa Claus you know you’ve got a fantastic Christmas book! “Your spines shine. Your eyes sparkle. You are the light of my life!” This always brings a tear to my eyes as Mama Porcupine declares her love for her Little Porcupine. Little Porcupine states to his mother he would like a part in The Baby in the Manger Play at school. With these words from his mother fresh in his mind Little Porcupine runs off to try out for the play. Much to his dismay (and to the children when I read this) his classmates decide there is no part for Little Porcupine to play. Discover how Little Porcupine does indeed become a “shiny spiny star” in the play! Probably my favorite Christmas story! A Christmas reading list wouldn’t be complete without this timeless classic. I like this version because of the Mary Engelbreit illustrations. Engelbreit’s signature trademark images found on each page compliment this memorable tale of Christmas. Children still enjoy this endearing and lasting tale of one’s look at Santa Claus on Christmas Eve! I still can’t get through reading The Polar Express completely without choking up! Each time I get to the conclusion of the story I recollect the vision of each of my own three girls as they made the shocking discovery about Santa Claus. Van Allsburg captures the mystery and wonderment of Santa Claus, Christmas, and the elves on one boy’s journey on an enchanting and captivating train ride to the North Pole. The young boy’s request for one of Santa’s sleigh bells and the magic surrounding what all of us hope to capture upon hearing the sound of the bell continues to bring joy to all of us who still believe. I’m quite fond of this “cowboy” version of, The Night Before Christmas, partly because of the western “twang” of the story. Two cowpokes aid Santa on Christmas Eve who has gotten sidetracked on the Southwestern Plains due to a blizzard. With the assistance of some “ornery longhorns” Santa is able to continue on his journey. The cowboys find quite a pleasant surprise in the end as Santa leaves them each a gift every cowboy would fancy! If you’ve never read this Christmas story or if you don’t have it as part of your own Christmas collection of books, I extremely urge you to buy this! The year is 1908, and the place is Abilene, Texas. The charming characters are quite the individuals who are young Art, who is committed to “the making of inventions, the quest for adventure, and the fighting and smashing of crime,” his faithful greatest buddy, Spaulding, and Art’s tag-along little sister, Esther. One day they receive a mysterious wooden box accompanied with this mysterious note: “Open the box. Assemble the contents. Come NORTH. Yours, S.C.” The adventure to “Toyland” ensues with Art, Spaulding, and yes, young Esther, traveling on the constructed Yuletide Flyer! On their journey they encounter and battle the Evil Queen and her Dark Elves. Once they return safely home after their visit with Santa all three wonder why exactly they were sent on this unexplained and puzzling escapade. Santa explains to them, “Some secrets are best left unsolved.” The secret of this entertaining and quite touching tale is revealed in two letters found at the conclusion of the story. Being a penguin has its limitations. Opus is a bird but he cannot fly. He is quite disgruntled, “A bird with wings that won’t work! What good is that? What good am I?” Opus tries various ways to rectify the flying dilemma but none seem to work to his benefit. Opus has only one wish for Christmas – to be “flying by Christmas morning.” While sitting by his fireplace with a portrait of his heroine, Amelia Earhart, looking down upon him, Opus crafts a letter to Santa stating his quandary and his desire for wings that work. On Christmas Eve, Opus is awakened by a snow duck with a calamity – Santa and his sleigh have plummeted into the lake. Opus is called upon to rescue Santa before he and the sleigh sink! Discover along with Opus what truly makes him special and how he is rewarded by Santa and the snow ducks on Christmas morning! Like me, you might find yourself shedding a few tears of joy by the end! Keena Ford and the Second-Grade Mix-Up Book Giveaway Contest! So begins this amusing and enjoyable first book in the Keena Ford series by Melissa Thomson! Keena lives in Washington D.C. along with her mother and brother. Her mother and father are divorced but her father is very much in the picture. Keena is a vivacious little girl who somehow or other unintentionally manages to get herself in the middle of some monkey business. She doesn’t really mean to – it was a “failure to communicate” between herself and her second grade teacher, Ms. Campbell when she accidently writes her birthday as 9/2 instead of 2/9. Keena decides to keep mum about her error when she discovers Ms. Campbell will be bringing a chocolate cake for her birthday treat! Keena comes to the decision not to correct the error! “Oh what a tangled web we weave once we practice to deceive.” Keena should have heeded this warning but like most children it is truly unintentional. I thought this story taught an excellent lesson as to the repercussions to children when they fail to tell the truth. The message it delivers is: it’s best to always be truthful. The book also touches on the subjects of jealousy and forgiveness. A wonderful way to discuss these ideas would be to read this together with your child. This series is told in a way children can understand – from the point of view of second-grader, Keena Ford. Melissa Thomson definitely has a winning series on her hands! What a remarkable beginning chapter book for kids! Keena Ford and the Second-Grade Mix-Up is nominated for the 2011 Illinois Monarch Award – quite an honor! There are two other books in the series so far, Keena Ford and the Field Trip Mix-Up AND Keena Ford and the Secret Journal Mix-up. All three of these titles are always checked out of my K-4 Library with many holds placed on all of them! Kids who have enjoyed the Junie B. Jones and the Clementine books will find Keena is another young mischievous girl to add to their reading list. Have I enticed you to pick this book up?! I hope so. I’m quite certain you will love the adventures of Keena Ford! 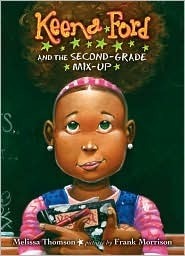 I’ll be giving away an autographed copy of Keena Ford and the Second-Grade Mix-Up to one of my lucky readers! To enter to be the ONE lucky winner, leave a comment as to who was your favorite fictional girl character when you were growing up. I’ll announce the person who will be receiving the giveaway next Friday, December 10th. It would definitely make a fabulous Christmas stocking stuffer for a young child!